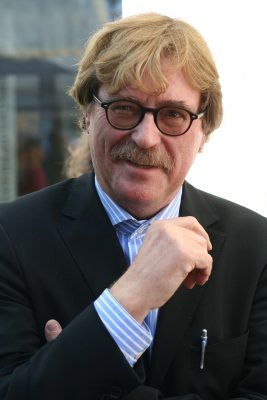 Viktor Seroneit, the founder of the "Plakat Kunst Hof Ruettenscheid" in Essen, Germany, died unexpectedly last Saturday while on a short bike trip. A civil engineer, with a passion for posters and people, he organized an international poster competition "Children are the rhythm of the world" in 2001, and the theme remained dear to his heart. Since 2009, thousands of Essen's school children play cardboard drums decorated by some of the worlds top poster designers, on World Childrens Day. The "Plakat Kunst Hof Ruettenscheid" was not only Seroneit's place of business, but also a gallery, bar, exhibition space, Felix Buettner's studio, meeting place and discussion podium for Essen's political elite and culture center. It is also the name of an organization founded by him, Felix Buettner, Uwe Loesch and Niklaus Troxler that awards annual prizes to distinguished international poster designers, the latest in 2010 to Stephan Bundi from Switzerland, the next to Malte Martin from Paris. Seroneit is also credited by Essen's Mayor Reinhard Pass with helping to make the German Poster Museum part of the prestigious Museum Folkwang. "He is not only a man with ideas, but knows how to get things done". Essen's press describes him as a "networker". I remember Viktor as a friendly, open, easygoing, generous man who wrote the songs for his band and made sure I got my currywurst at the party.